It’s always tempting to address a writer’s body of work through their most recently published book, and never more so than when the writer in question has recently passed on. 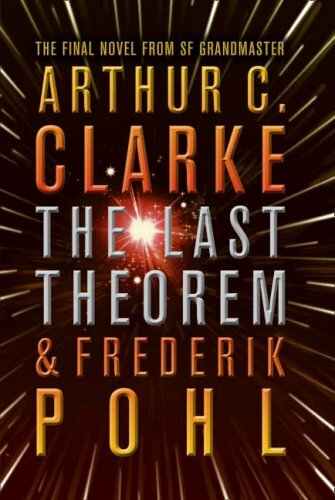 Arthur C Clarke died in March this year aged 90, having started The Last Theorem in 2002.Unable to finish it due to his ailing health, he invited fellow science fiction heavyweight Frederik Pohl to complete the book, although he apparently read and approved the finished draft just a few days before his death. However, it would be a real shame if this massively influential author’s legacy as a futurist and writer hinged on this final novel. The Last Theorem tells the story of Sri Lankan protagonist Ranjit Subramanian and his obsession with Pierre de Fermat’s infamous mathematical theorem. In real life, Fermat’s last theorem went unproven for 357 years until 1995, when Andrew Wiles published a proof. In Clarke and Pohl’s novel, the story begins by introducing Ranjit as the son of a Hindu priest and a student in the Sri Lankan capital of Colombo. He is obsessed with maths and astronomy, and when he is caught in a compromising situation with his best friend Gamini Bandara, his father disapproves, not because Gamini is male, but rather because he is of the wrong social class. As a result, Ranjit is temporarily disowned by his family and, in a bizarre twist of events, is kidnapped by pirates and held captive for several months. With nothing to do except think about maths, he hits upon a solution to his life’s obsession – Fermat’s last theorem. When he’s released and the proof is published, Ranjit is catapulted into a position of global recognition. As a result of his new found fame, he comes into contact with representatives of a shadowy international organisation, Pax per Fidem (Peace through Transparency), keen to recruit his services as a mathematician. Ranjit can initially find out little about this group until an overnight military attack on North Korea brings them into the light of public scrutiny. Pax per Fidem is the guardian of a new super weapon held in common by the largest of Earth’s nations – silent thunder. Based on electromagnetic pulse technology, the weapon destroys all electrical devices for hundreds of miles in every direction but leaves people unharmed. When North Korea is effectively neutralised as a nuclear threat, a new period of peace arrives as rogue nations around the world are rendered impotent. However, unbeknown to the people of Earth, a race of overlord beings known as the Grand Galactics have had their attention drawn to Earth by the unmistakable trace signatures of nuclear explosions. The book follows Ranjit throughout his life from youth to old age, taking in his involvement in the new world order that emerges as a result of the use of silent thunder, as well as his marriage and subsequent children. However, the characters around Ranjit are not well fleshed out and, as a result, it’s hard to stay truly immersed in the story. The Last Theorem is an imaginative and challenging book, but many of its ideas and themes will already be well known to Clarke’s fans. Most, such as the use of space elevators and the question of man’s place in a wider universe likely to have intelligent life, have been dealt with before in previous works, most notably in Fountains of Paradise, Childhood’s End and the hugely influential 2001: A Space Odyssey. What this book does very well is to take some fascinating science and maths, and make them intelligible. It’s just a shame the story doesn’t carry its technological payload a bit more proficiently.